(Mens M) Ugly Xmas Sweater Vest. Happy Teddy Bear & Glittery BEADED Gift Towers! 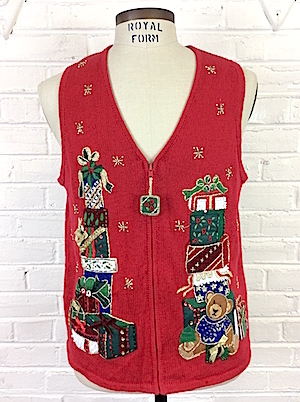 Home > Items just added 4/3-4/17 > (Mens M) Ugly Xmas Sweater Vest. Happy Teddy Bear & Glittery BEADED Gift Towers! Ugly Christmas sweater vest! This little number has two giant towers of gifts in Red, White, Green, Gold and Blue with all manner of beads, sequins and glittery thread. Some of the presents have glittery or velvety bows. A little brown and gold Teddy Bear with a blue shirt and a sublime smile sits with one of the towers with an Xmas tree and a present. Gold and Silver beaded stars are scattered throughout, and the zipper is a little green and gold present with embroidered red flowers. Fancy zipper pull tab. Back is solid red. Collar, cuff and hem are ribbed, collar has Gold thread accents. Has shoulder pads, easily removable. Made by Heirloom Collectibles. Ramie/Cotton. Condition: Very Good. Missing a few beads. Does not detract from the awesomeness of this sweater!